Don't miss our fantastic Comedy Night coming to the Forum Theatre this Christmas, the perfect way to see in the festive period with your friends and work colleagues alike! 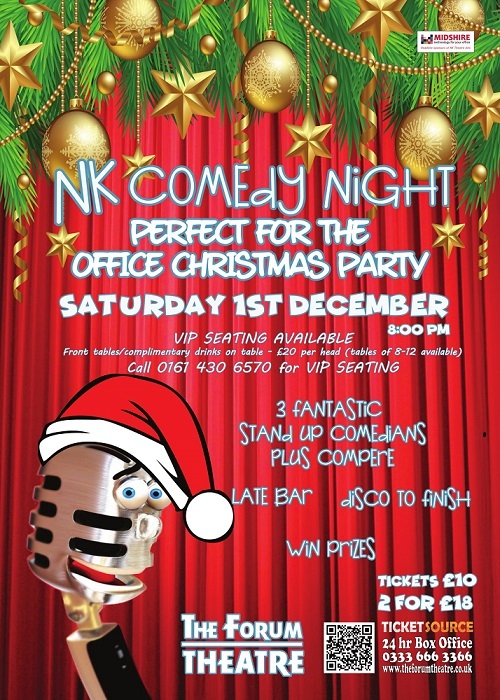 As ever we have three brilliant acts plus a wonderful compere to have you laughing the night away. There is a late bar and music to finish the evening. This event is not suitable for children. Prices will also remain at just £10 or £18 for two seats. VIP Seating is also available which includes priority seating and a brilliant drinks package too, so grab your tickets before they all go and enjoy a fantastic night out this Christmas. Brennan Reece, Live at the Apollo and Young Comedian of the Year!